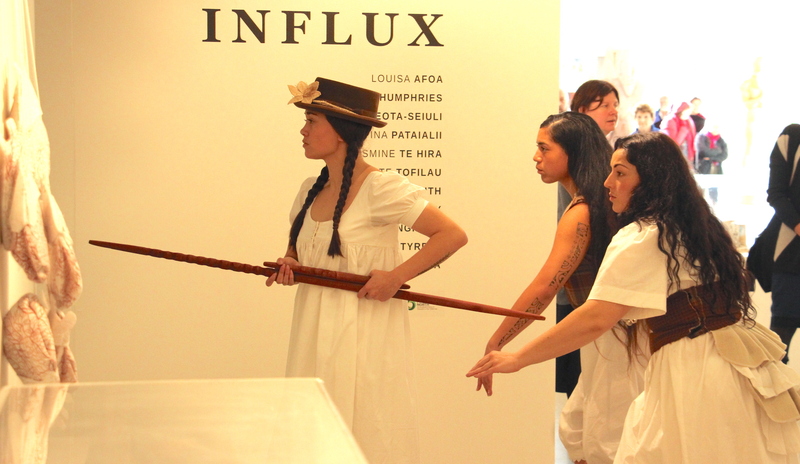 An innovative performance installation performed in art galleries and museums, Fire In The Water, Fire In The Sky is created + directed by Mīria George and performed by Te Hau Winitana + Mapihi Kelland. Fire In The Water, Fire In The Sky is a modern statement of climate change + colonisation across the Pacific, an untangling of the greatest collision to have affected Te Moana-nui-a-kiva – western imperialism. Told through movement, dance, song + text, Fire In the Water, Fire In The Sky is a cautionary tale of greed, destruction + big business, Fire In The Water, Fire In The Sky is a search for hope. Created in Hawai’i Nei in 2017 as part of Mīria’s Fulbright-Creative New Zealand Pacific Writer in Residency at University of Hawai’i at Mānoa, the Kia Mau Festival season in June 2017 marked the premiere of Fire In The Water, Fire In The Sky. Featuring design by Cara Louise Waretini + Tony De Goldi. This work is produced by Tawata Productions.